KING STREET on the afternoon of Monday 27 November is looking drizzly, but very Christmassy. Decorations shaped, I think, like the 'Taurus' astrological sign have been hung by Manchester City Council along King Street for several years now, perhaps a change is in order. The continental-style advertising column on the left is promoting a very British chocolate bar that's been popular for well over half a century (Mars). Further along the street you'll find upmarket boutiques, including Hermes, whose scarf exhibition I featured almost exactly a year ago. 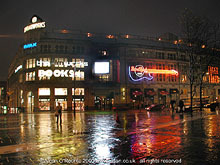 THE PRINTWORKS entertainment complex is seen here the week after its official opening in November 2000. 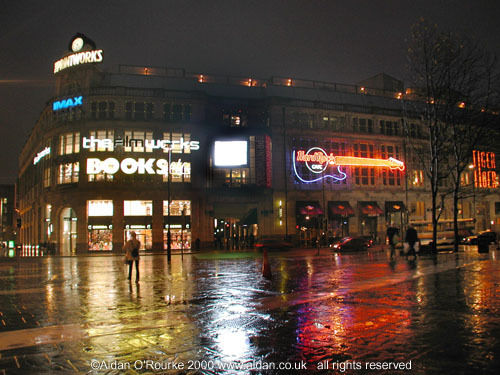 The exterior lights have introduced an exciting splash of neon colour into the city centre, though the upper neon tube of the Hard Rock cafe guitar is out of order. The video screen, so bright it appears white in the picture, is showing images of blue skies, green, oceans and holiday beaches. 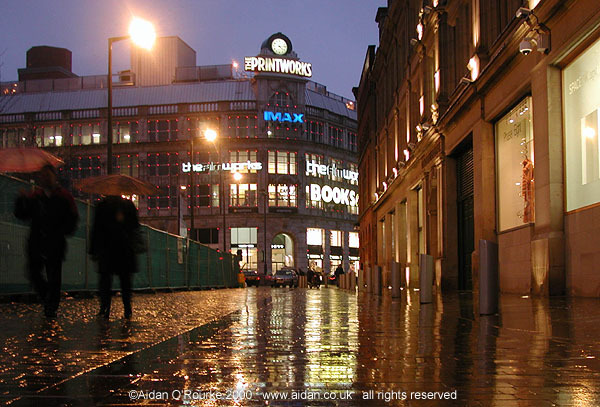 Imax refers to the Printworks' Imax Cinema, the first one in the north west. Films made in the Imax format are projected onto the giant Imax screen, which is several storeys high.It's an amazing visual experience, and one which I'll be mentioning again. FENNEL STREET was until recently a busy city centre route used by buses, cars and other traffic. Now it has been pedestrianised - good news for people when they're on foot, but not so good when they get into their cars and get stuck in traffic jams. To the right we see the north facade of the Corn Exchange, now redeveloped as an upmarket shopping centre and renamed 'The Triangle'. Straight ahead we see the recently-opened Printworks, an imaginative and fun-filled entertainment complex with shops, restaurants, theatres and much more. To the left, the Urbis centre is under construction. 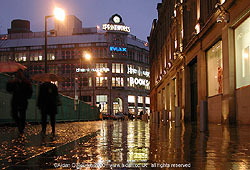 It's a rainy November afternoon in Manchester (4.15pm Thursday 23 of November 2000, to be exact), and the newly laid cobblestones are covered with a film of rainwater. Autumn 2000 has been the wettest autumn since records began - not just in Manchester, but all over the UK. The few people who have benefited from the wet weather are umbrella manufacturers. 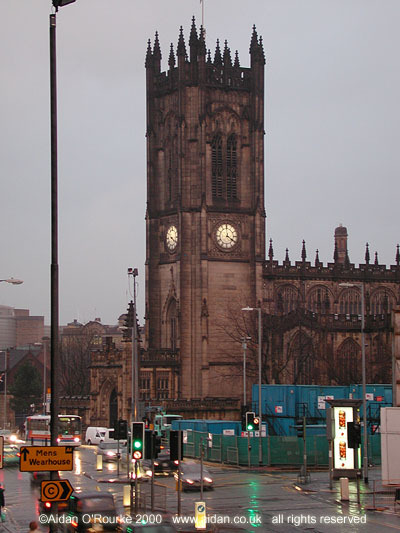 MANCHESTER CATHEDRAL stands at the centre of Manchester's so-called medieval quarter, which is currently undergoing redevelopment. The blue portakabins are being used by construction workers and will be removed when work is complete. The area surrounding the cathedral is to be landscaped, turning busy roadspace into a city centre park. In the picture on the left, originally captured in black and white, I've removed some of the street clutter and added a little subdued colour. VICTORIA STATION and the CIS building are seen here from Walker's Croft, a cobbled street which slopes down behind Chetham's School of Music, and comes to a dead end some 20 feet below the station approach. 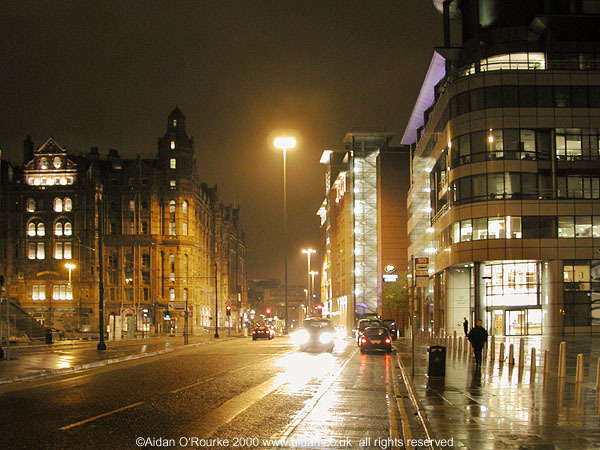 It is one of the many mysterious streets in Manchester that are vestiges of the older city. This street in fact used to run along the banks of the River Irk, which was covered over when Victoria Station was developed and extended in the 19th century. 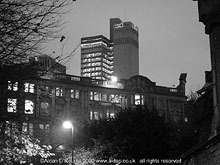 This view of Victoria Station and the CIS building is only possible due to the demolition of the former Lancashire and Yorkshire Railway offices, which until the 1980's stood roughly where the trees are now. 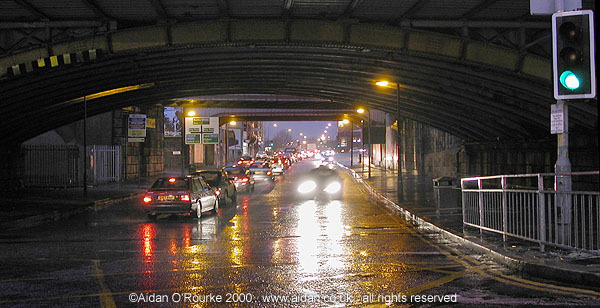 GREAT DUCIE STREET leads out of Manchester city centre, under the Victoria Station railway bridge, and north towards Bury. 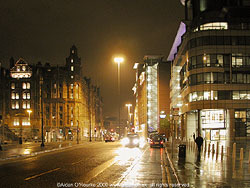 This section of road is often clogged with traffic in both directions, particularly since Manchester city council closed a number of city centre roads and changed traffic directions. Just beyond the bridges is the junction, indicated on the sign, where Great Ducie Street intersects with Trinity Way - a new dual carriageway which runs from Cheetham Hill Road to Chapel Street Salford. The videoclip can be downloaded from this location. MANCHESTER'S CHRISTMAS LIGHTS were turned on by Russell Watson, who sang two songs, and by Father Christmas, who had specially flown into Manchester from Lapland. Despite the chilly weather, the turnout was excellent, with thousands of adults - and many children - crowding into Albert Square. The firework display was - well - quite good, though it never seemed to reach the climax we were expecting. 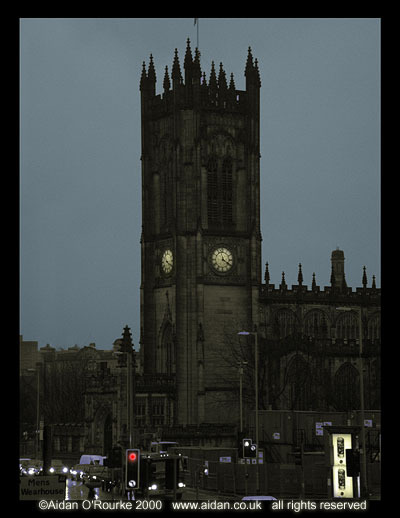 I captured the event in this thirty second videoclip, the first of many Quick Time videoclips which will be appearing in Eyewitness in Manchester. 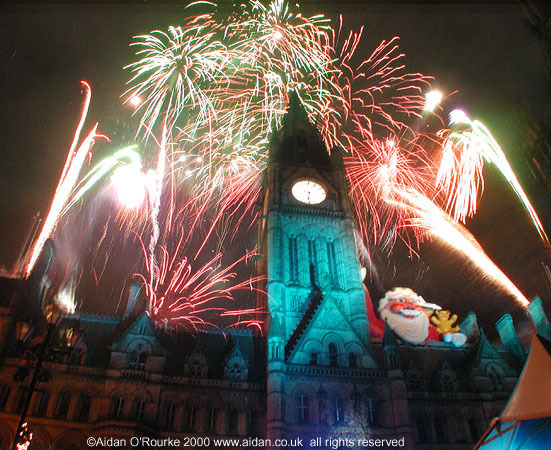 THE CHRISTMAS LIGHTS SWITCH ON took place in Albert Square Manchester, Sunday 19 November 2000. 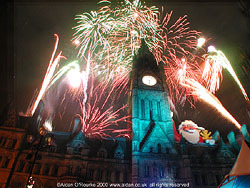 The event was marked by a firework display above Manchester's Victorian Town Hall. It was good, but didn't quite reach the intensity some firework displays I've seen recently. In this image, I've selected several shots captured during the display, and pasted them one on top of the other. Not quite true to life, but it shows what we would have seen had more fireworks had been let off at the same time. 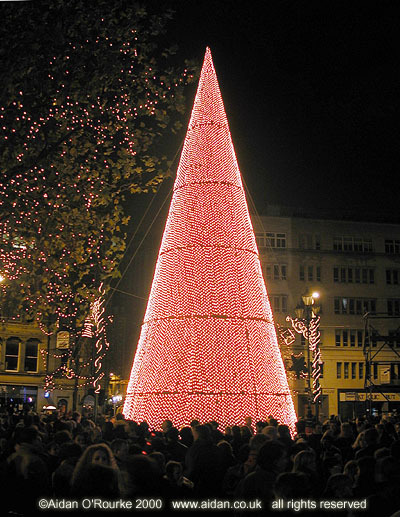 THE ALBERT SQUARE CHRISTMAS TREE 2000 - Tasteful, minimalistic and ecologically sound, or a giant dunce's cap? Manchester City Council chose this year erect the latest design of artificial tree, rather than a traditional one which has a tendency to blow over in high wind and requires a lot of maintenance. This 21st century Christmas tree is made of sections which bolt together, and it has several thousand lights. 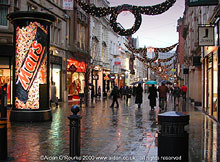 Here we see it just after the Christmas Lights switch on, which took place on Sunday 19 November 2000. After the countdown, I half expected it to blast off into space, like the Shuttle. Eyewitness says: I haven't made my mind up yet. What do you think? 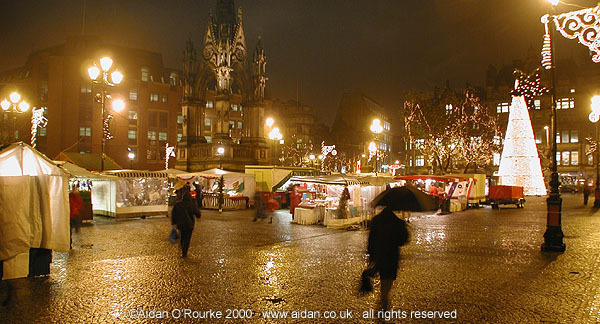 A EUROPEAN MARKET is being held again in Albert Square. The market is sponsored by the city council, and offers a selection of market traders from Holland, Germany, Ireland and Austria (but not France). Here we see the market in its third day of operation on Thursday 23 November 2000. On the far right is the city council's controversial cone-shaped Christmas tree. LOWER MOSLEY STREET Manchester was once a murky, run down street next to the former Central Station. In the year 2000, it has been transformed into a high tech office and leisure boulevard used on part of its length by state-of-the-art trams. On the left is the Crowne Plaza Midland Hotel. Across the street a new hotel stands on the site of the late lamented 'Tommy Duck's' pub, and to the right is part of the futurustic Barbirolli 1 and 2 office complex. 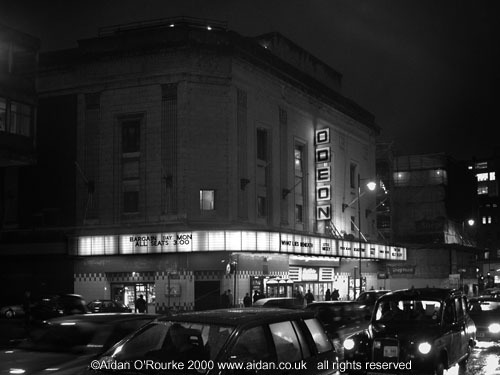 THE ODEON CINEMA is a survival of the 1930's golden age of cinema, and stands at the top of Oxford Street, near St Peters Square. 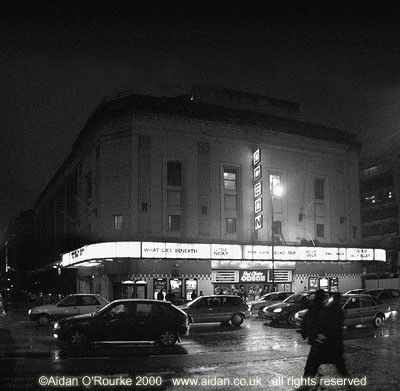 Though split up into a number of smaller theatres, the Odeon is still a magnet for movie-goers in the city centre. It's about 5pm Thursday 23 November 5pm, and there's heavy traffic on Oxford Street, including one of Manchester's black cabs. 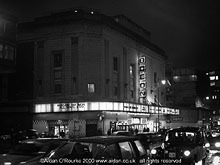 The films currently showing at the Odeon include "What Lies Beneath", "Little Nicky", "Pitch Black" and "Billy Elliot". Under construction to the right of the cinema is the Roundhouse, a new hotel and leisure complex. To the left, on the other side of George Street, is Elisabeth House.